A fireplace can be an attractive addition to any room, but a fireplace with a Napa Forge 4 Panel Belvedere Pewter Screen can truly elevate the elegance of your home. Complete with high-quality brass construction and classic styling, this hearth accessory provides a perfect accent for any fireplace or insert. Regardless of whether you've got a fire going, you'll love the way this screen looks. Elevates the elegance of your home. Complete with high-quality brass construction and classic styling. NOTE: Screen Sizes Listed Are For Actual Framed Mesh Area And Do Not Include Feet Or Decorative Finials. Allow 1/8" Tolerance Due To Hand Forging. Hand forged with attention to detail. 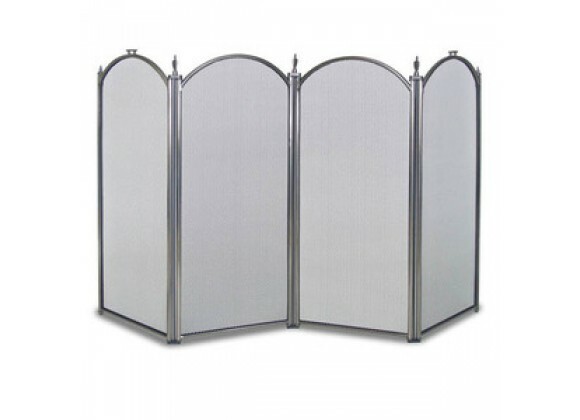 Full arch four-panel screen encompassing artful scrolls.